Sooner or later, every driver winds up hearing the unmistakable sound of their car failing to start. And while a failed ignition can have several causes, more likely than not, it’s a battery that wound up dying on you. Although a dead vehicle battery is a simple fix that carries a relatively affordable price tag, it can still become an inconvenient situation. That is especially true if your car is nowhere close to where an auto shop is, or if it’s after hours. No matter when or where you discovered a dead battery in your car, San Jose Towing CA is here for you. Our team offers safe and reliable battery jumping service, keeping you behind the wheel for longer. Other companies may rely on rusty old jumper cables and longer response times. However, when you hire us for your dead battery needs, it means getting the best service faster and for less. 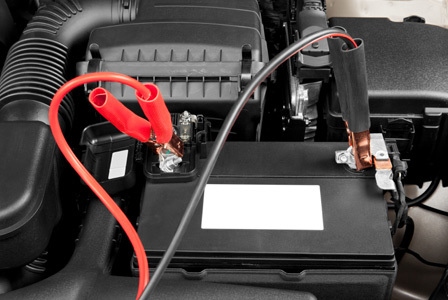 The clear solution to a damaged or drained car battery is to replace it with a new one immediately. However, just because that is the fix that will work the best doesn’t mean that it’s a readily available option for your exact situation. Whether you work the third shift, are miles from the closest auto parts shop, or lack the tools and equipment to replace your battery on the spot, it can make a long day out of a quick solution. Instead, you can always call our San Jose, CA expert drivers and experience help immediately. We continue working hard for our community 24-hours of every day. We understand that there is no limit to when a battery may decide that it’s out of juice. Flagging down a stranger may wind up harming your battery and even your vehicle. Instead, just call us, and we guarantee the faster, more reliable service over anyone else around. Buying a package of jumper cables can remain a relatively inexpensive purchase. Why should you call us instead of handling the issue yourself? Although television shows and movies make jumping a vehicle battery look like a straightforward task, it can cause a ton of damage and harm if not done correctly. Even dead batteries retain enough charge to shock you or short out the circuitry of your vehicle. The last thing that you need is to fry the system’s chips and fuses. Even if the cables that you purchased were cheap, the vehicle repair costs are going to exceed your budget if not done right. Rather than putting your car further at risk, our drivers know the right way to jump start virtually any vehicle. Call us first before attempting any other method of reviving your car battery. A dead vehicle battery is often a significant inconvenience, even if the rest of your car is still in great shape. Before allowing yourself to get frustrated, call San Jose Towing CA for the reliable choice in battery vehicle jump-starting services.